If you're a little bored of life on Earth, have no fear; scientists have discovered two potentially habitable planets orbiting a sun just 12 light-years away. 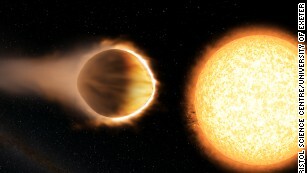 The team of astronomers which includes researchers from the UK's University of Hertfordshire and the University of California Santa Cruz, revealed that four Earth-size planets in total have been detected orbiting the sun-like star, known as the tau Ceti. They dubbed two of the four planets "super-Earths," so-called because they have masses of around 1.7 Earth mass, larger than Earth but among the smallest planets ever detected around the nearest sun-like stars. "[The habitable zone] is the 'Goldilocks' region around a star where the planet is not too hot or too cold and thus is able to sustain liquid water on its surface," Dr Fabo Feng, the study's lead researcher, told CNN. Feng added that the planets are likely made "made of rocks rather than ice" which would increase the chances of them supporting life. It's really nice that humankind finds new discoveries all the time.